The ancient Egyptian god of creativity and fertility, Amon Ra is astrologically related to the constellation and astrological sign of Aries. The Amon Ra Ring transforms a detailed ram skull into a wonderful thing of Baroque beauty. 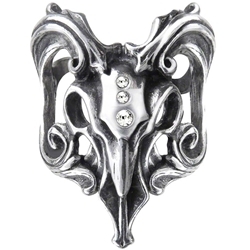 This polished pewter ring displays this stylized ram skull on a split shank band. Clear Swarovski crystals are set into the forehead of the gothic skull ring, while floriated horns curl in scrollwork patterns along the sides. You can pair this fine Egyptian ring with its matching necklace (17-P656) for a stunning look. This skull ring makes a great gift for anyone with a love of gothic style or astrological horoscopes.